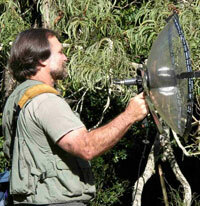 The Swedish-made Telinga Stereo Parabolic Microphone is the tool I use most for recording individual creatures. It is highly directional and sensitive, and yields a fine stereo image. 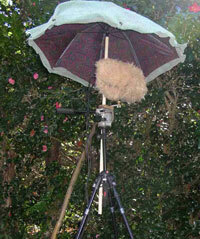 For recording stereo ambience or soundscapes I use a pair of Sennheiser MKH 20 microphones in various configurations. For high sensitivity, low self-noise, and durability these are the best omni-directional mic's made. 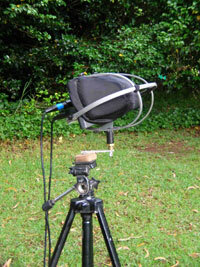 My most-often-used set-up for soundscape recording is this tripod-mounted SASS (Stereo Ambient Sampling System) modified to use the Sennheiser MKH-20 omni microphones. The cage is a further mod to allow placement of a windscreen over the unit. This rig is for stereo hydrophone recording, to be suspended from a drifting boat, or from a boat anchored in little current. 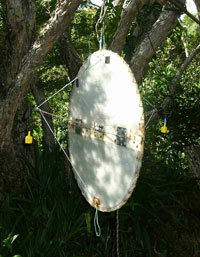 A ballast weight hangs from the 3 foot disc, while the hydrophones are suspended by bungee cord from the outriggers. The whole rig folds in half for transport, with or without hydrophone elements deployed. Material is bubble-wrap sandwiched in Lexan, with liberal use of Velcro.